Hey guys! Now that December is in full swing, I wanted to bring you some gift guides (I'm jumping on that bandwagon), to give you some great ideas for any holiday gifts you might still need. I know that I am always scrambling for one or two last minute things, so I'm here to help you, my friends! 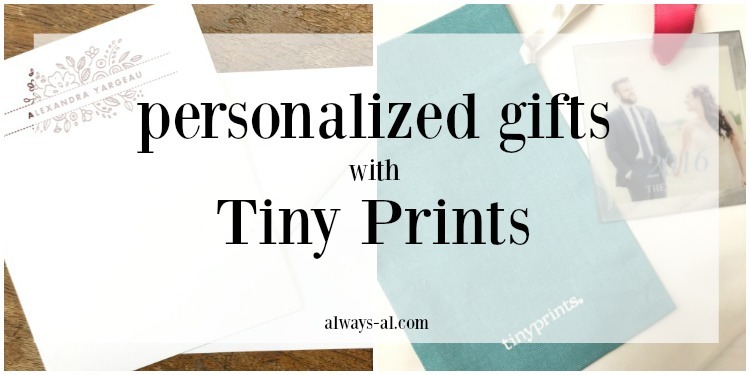 If there is one thing that I always turn to when giving gifts, it is personalized things. I love giving people things that are made specifically for them, because it feels so special. My MIL loves photos of family. My first thought for her was to make a photo book of the nice family photos that were taken at the wedding. I may do that in the future, but when I saw the Fab Four Lapis Glass Ornament, I knew I had to get that. Whenever we are home for Thanksgiving, we ALWAYS get our Christmas trees together on Black Friday. We haven't been able to be in Rochester for a few years, but I thought an ornament with the year and a wedding photo would be a great gift for her. This is a very nice glass ornament with a photo printed on it. It comes with a red ribbon to hang it on your tree. I also loved that it came with this cute cloth bag to protect it when it's stored. I also picked out some personalized stationary for myself. Why NOT get yourself a gift this holiday season, am I right? I love sending snail mail, and what is better than having some beautiful stationary with your name on it. I went for the Dotted Greenery Letterpress Stationary in the color Berry. I absolutely love how this turned out, and can't wait to send some letters to some special friends! Is it weird that I am still giddy when I see my new name? These cards are thick, and the raised design makes it feel so elegant. There is also a very impressive selection of Tiny Prints Christmas Cards that are just stunning. I'm not sure how I could possibly choose a favorite. I LOVE me some gold foil on Christmas cards, it just feels so special. I love to frame our Card for the year, and have it out. Is that just me?